Facts and history about the life and lifestyles of Native American Indians. The Native American Indian Recipes varied from tribe to tribe and were dependent on the natural resources that were available in their location. What did Native Americans eat? Protein foods such as fish and meat were supplements by wild vegetables and greens, nuts and grains and berries and fruits. Domesticated crops included Corn, Beans, Squash, Tomatoes, Peppers and Potatoes. The traditional Native American Indian Recipes include Succotash, Popcorn, Clambake (Quahog), Buffalo Stew, Pinole, Popped Wild Rice, Sofkey and Sunflower Seed Cakes. For additional facts on cuisine refer to Native American Indian Food. Native American Indian Recipes: Popcorn is a type of corn (maize) that was eaten by many tribes including those who inhabited the Great Lakes region such as the Mohawk and Iroquois and in New Mexico such as the Pueblo and Zuni. The Native Americans prepared popcorn by popping corn in pottery crocks with heated sand. 5. Add topping or seasoning to taste and then serve. 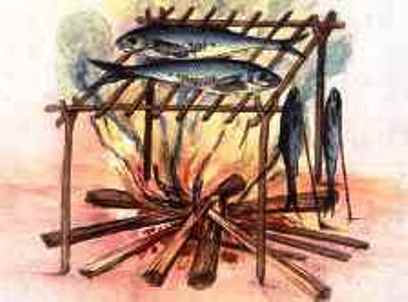 Native American Indian Recipes: Native American Indian tribes, such as the Pequot, Wampanoag, Powhatan and Pennacook, who inhabited the coastal regions of New England cooked clams, mussels, crabs and lobsters in sand pits layered with stones and wet seaweed. Native Americans used the hard shell clam, known as Quahog, to prepare feast for special occasions and the idea was adopted the tradition which they called Clambakes. Native American Indian Recipes: Buffalo meat was the staple diet of the tribes of the Great Plains such as the Sioux, Blackfoot and Cheyenne. The following buffalo stew recipe can be substituted with beef. Buffalo has a texture and taste similar to beef but is much leaner. Dried buffalo meat called Pemmican, was a nutritious, preserved food that was prepared by the women of the Plains tribes. Native American Indian Recipes: Pinole is a traditional cornmeal drink that was enjoyed by the Southwest tribes including the Hopi. Pinole can be served either hot or cold. Native American Indian Recipes: Wild Rice was one of the staple foods of the tribes who inhabited the Great Basin region including the Bannock and Paiute tribes who harvested wild rice. 3. Stir in the wild rice. Native American Indian Recipes: Sofkey is a sour corn porridge made with grits that was enjoyed by Native tribes who once lived primarily in the southeastern United States including the Cherokee, Choctaw and Creeks. Grits are small broken grains of corn - "corn grits"
Native American Indian Recipes: Many Native American Indian cultivated their lands and raised the 'Three Sisters' crops of corn, beans and squash. Many other tribes such as the Navajo and Pawnee also raised crops of sunflowers.